I vividly remember the first time I saw the movie Titanic. The passionate love between Jack and Rose awakened something fierce in my little preteen heart. I thought little of marriage before that movie. Now it consumed my thoughts and dreams. Though Titanic is now twenty years old, the same romance-as-savior theme is still present in our culture. But surprisingly, many churches don’t reject this lie. They Christianize it. Youth leaders, aware of their teens’ lust for romance and sexual intimacy, are eager to steer students away from poor decisions, and rightly so. But instead of pointing to a present Christ as the promised prize in the fight against lust, far too many point to a future spouse. This strategy may succeed in preserving the virginity of young Christian teens, but the “think about your future spouse” approach misses the heart of the Bible’s message that Jesus alone can satisfy. One specific manifestation of this is the practice of writing notes to a future spouse. There are dozens of Christian articles on how and why to write to a future husband or wife. Though many people believe in this practice and encourage it, it keeps our focus in the wrong place. It subtly (or overtly) puts our hope for happiness in someone other than Christ. So, in the interests of putting marriage in its proper place, here are four reasons to set your hope in a present Christ rather than a future husband or wife. 1. God doesn’t promise marriage. God gives many promises for those in Christ, but none of them includes a spouse. Yes, marriage is a wonderful gift and one worth praying for, but God doesn’t guarantee we will marry. Even for those who are given this gift, it is not promised for a lifetime, as many young widows can attest. This is a shocking reality to many, likely due to a misapplication of Psalm 37:4, “Delight yourself in the Lord, and he will give you the desires of your heart.” “If I desire marriage,” we reason, “God said I need only delight myself in him, and he will grant it!” But God does not specify how and when he will grant those desires. For example, other desires often sit underneath the desire for marriage — desires for intimacy, belonging, wholeness, and companionship. But these are all desires God promises to meet in himself, whether we get married or not. He does not need marriage to satisfy the ache in our hearts; he only needs himself. God will give us the desires of our hearts — but in such a way that we’re singing praises to Jesus, not to a spouse. Don’t hope in a promise that God has not given. Instead, put your hope somewhere secure: on the rock of Christ. 2. Marriage can’t handle the pressure. Channeling all of our longings into marriage will crush it. No one person can handle the weight of our desires. The idea of a perfect mate can haunt us when we’re living side by side with another sinner. 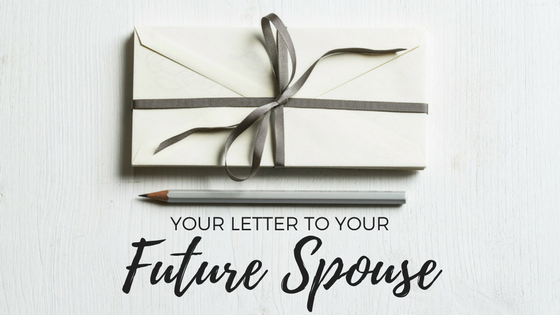 When we write romantic and idealistic letters to a future husband or wife, we set our hearts in the wrong place and build unrealistic expectations. The more we pour into the letters, the further our future husband or wife will fall short of our standards. Despairing disillusionment is common in Christian marriages likely because the partners have put too much hope in the marriage itself. Marriage is a terrible savior. But if we keep Jesus as our source of hope and joy, he will sustain us through every change in our relational status, and all the ups and downs of married life. 3. Singleness is not a subpar alternative. Eagerly hoping in a future spouse can be a way to avoid the sting of prolonged, unwanted singleness. But God doesn’t see singleness as a curse — he sees it as a gift! The Bible calls singleness the greater alternative, one that promotes undistracted devotion to Jesus (1 Corinthians 7:32–35). Although it’s true that most people will marry, that doesn’t prove that marriage satisfies. There are just as many unhappy married people as there are unhappy single people. Both groups face the same daily battle: Will I fight to find my joy in Jesus today? The longing for marriage does expose one truth: eternal life is found in intimacy, in knowing and being known. But the intimacy we were made for is not intimacy with a fellow sinner, but intimacy with God through Jesus: “This is eternal life, that they know you, the only true God, and Jesus Christ whom you have sent” (John 17:3). 4. God is supremely valuable. Banking our joy on a future spouse assumes we cannot be satisfied and whole without marriage. But marriage is not the grand prize of life — God is. He is the treasure in the field worth selling all we have to own. “A day in your courts is better than a thousand elsewhere” (Psalm 84:10). Though we cannot see, touch, and hear God like we can a fellow human, he is more real and more enjoyable than human intimacy ever can be. Draw near to him and he will draw near to you (James 4:8)! Take the energy you might put toward meditating on a future spouse and instead meditate on God, who has revealed himself to us in the pages of the Bible. The end of Titanic pictures a heavenly reunion of all those who died in the 1912 tragedy. A youthful Rose walks through the crowd and approaches her one true love, the one who saved her. Finally, she is united with Jack. Forever and ever, amen. Christian, do you recognize this narrative? It is a shadow of the happy ending awaiting us. One day, we will be reunited with believing friends and family members, and we will finally see our One True Love face-to-face, the One who saved us in every way a person can be saved. But it will not be our spouse, but Jesus. His love saves us, satisfies us, and sustains us. Married or single, he alone should be the central figure in our lives. Don’t lay the weight of your desires, hopes, and dreams on an earthly marriage, but on Christ. Only his love is strong enough to sustain you.